My entry for Ludum Dare 37 (theme: one room). You're an interior decorator, and your job is to give your clients nice and shiny new homes. Take note of their demands and try to give them exactly what they want. - a whopping 8 different pieces of furniture! - a massive two (2) unique clients! - almost 30 furniture styles! Feel free to post screenshots of any neat rooms you decorate! Haha had fun playing it! I like how you characterized the clients, just with the style and a few words and you can already figure what they want. And, what it is that the wife doesn't like?? That's a really slick game. The controls are intuitive, the graphics are really clear. I couldn't figure out what the second guy's wife liked either, but I enjoyed it all the same. I'd love to see this taken further. Nice concept, the game feels really good to play. I managed to please the second client wife, dunno how, I added of bunch of different stuff :D.
Congratulations on the entry, it's a really fun game and deserves to be fleshed out. Things I hoped I could do was rotating the furniture (probably left out for time reasons). This would work well on mobile, too. In addition, made me interested in the platform you made this! Making a house was quite fun and a good concept, good job dude. Art was also amazing. But please do not use X/Z combination. Some keyboard layouts do not have those keys next to each other. @KaiseanGames: the buttons are outside my control, unfortunately, as the Pico-8 fantasy console binds those two buttons to Z/X by default and can't be changed in the web player and only in the standalone client. I had great fun, i spent time trying to figure out what the wife wanted, couldn't do it. Anyway, the art is great and controls are smooth. The only thing i would wish was to be able to rotate the furniture. Other than that, it was a great game. Thanks for the game, nice graphics! It's always nice to see a pico 8 entry! Cute entry, I wish it had more characters and gameplay. But overall, good job ! Funny, but too short. Need more clients, also some smart logic about how I place items in room, as I can do almost anything and still get all greens. Great work, pretty art and very funny. The face art is terrific, and yet you complain that chairs are hard to draw :D that had me laughing. Great work this weekend. 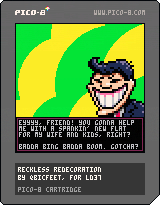 really nice pico8 entry! the graphics were very pleasing. I couldnt figure out how to pass all objectives, but it was neat anyway! Oh man, I really like this graphics! The interface and control are very worked. The spritework is nice and I'd be interested in seeing a more fully-fleshed out version of this concept, but as it stands it's a bit underwhelming. I have a feeling that it would have been more interesting if instead of having multiple variations of each furniture piece, more time was spent on the puzzle aspect (I assume the variations are actually worked into the gameplay though, since others seem to be having trouble dealing with the second client's wife). It was also a bit annoying that the double-height furniture always started one square below where it should in order for you to place it. I hope you plan on continuing this one beyond the jam; it does seem like it has potential! First I love the your sprite work and the general idea of the game. I also like the one lines in the menu. Yes, there is a lot left to do, but I think you got a solid start here. First, the player needs more information -- you could add a reminder on the bottom of the screen of the commands, and the budget. Also some feedback on the action would make the game a little more fun -- for example, a little screenshake when you place the furniture and one low note would make a whole world of difference, and wouldn't be that hard to implement. I hope to see you continue with these! I had a great time playing this game, but unfortunately with only two "clients" it makes for a rather shallow experience. I can imagine with a bunch more clients, maybe some color swapping, this game could have held my attention for a lot longer! Great game! I really liked this one. The graphics were fantastic, and it was a lot of fun.